By: Mariam Mikhael, YWCA of Lebanon. 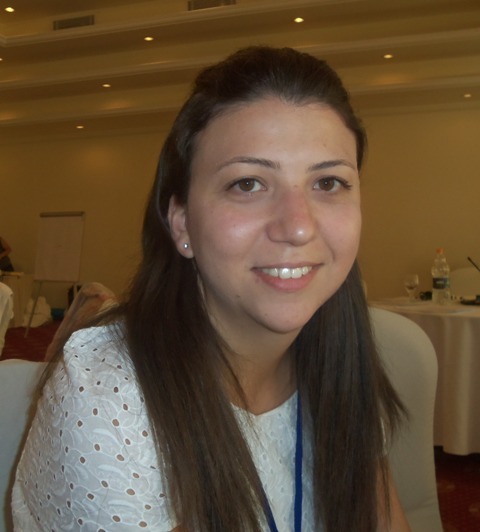 Mariam is a registered pharmacist and she is a Medical Affairs Coordinator in a drug company. Mariam joined the YWCA as a volunteer a year ago. Violence against woman is a taboo topic in the Middle East, a region where family and social appearances are a fundamental part of the society. Private problems are not to be discussed in public. Women’s rights in the region are at the mercy of religious, cultural and political powers. Lebanon prides itself with a strong education system and centuries of western influence, both culturally but also into its constitution. Yet, Lebanon too is not immune to violence against women. The women of Lebanon have rights, however they are not being implemented and many women are not aware of them. Women in Lebanon have a voice but they need help to be able raise it. In Lebanon we have more than 18 sects with different mentalities, cultural and educational backgrounds. Different civil and religious views, tensions and convictions are the source of all types of social violence that often start at home, in particular against women such as social, emotional, sexual, family, to name but a few. The YWCAs in the Middle East (Palestine, Egypt, Jordan and Lebanon) are working towards reaching out to their communities to raise social awarness and different means of support to survivors of violence. The YWCA of Lebanon has been focusing its work on violence against women, and Lebanon is the only country in the Middle East that offers a shelter to women and their children seeking protection, rehabilitation and emotional support. However, only about 15 women have benefited from the shelter, which demonstrates how much more work needs to be done! In addition, we organise awareness campaigns in schools and universities in order to educate young people on the importance of peace building and prevention of violence by encouraging them to talk and share their stories in order to receive the help and attention needed. All of the above has urged me to attend the World YWCA International Training Institute on Violence against Women and Peace Building, held in Korea in November. Attending the ITI will allow me to to share the experience with my peers and to widen my knowledge of new tools to implement effective solutions to solve the problems in our community. We live in a time of regional turmoil, a time when fear can enter people’s homes and can create renewed tension which can in turn be a new source of violence. I strongly believe in the importance and necessity of the YWCA’s efforts and work to prevent VAW and to address the problem on time in my country. I look forward to the International Training Insitute, to the exchanges that will take place and the people that I will meet.